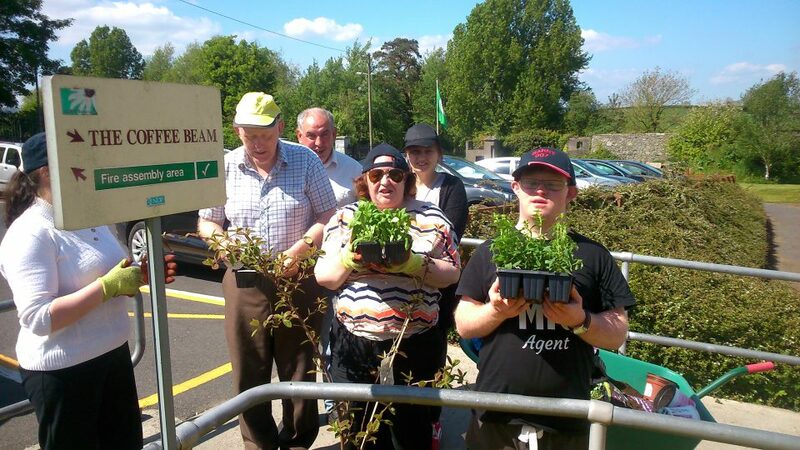 BEAM (Barrow Enterprises for Adult Members with Special Needs) Services is an adult education centre providing training to adults with special needs. It has 31 students and 22 teachers. They were awarded their Green Flag for Biodiversity in May 2017. The Green-Schools Committee is made up of 17 service users, the Green-Schools Coordinator and six other staff members. They meet fortnightly. The Committee did further work for the Environmental Review, in order to develop a clear picture of what was really needed on their grounds to help promote biodiversity. 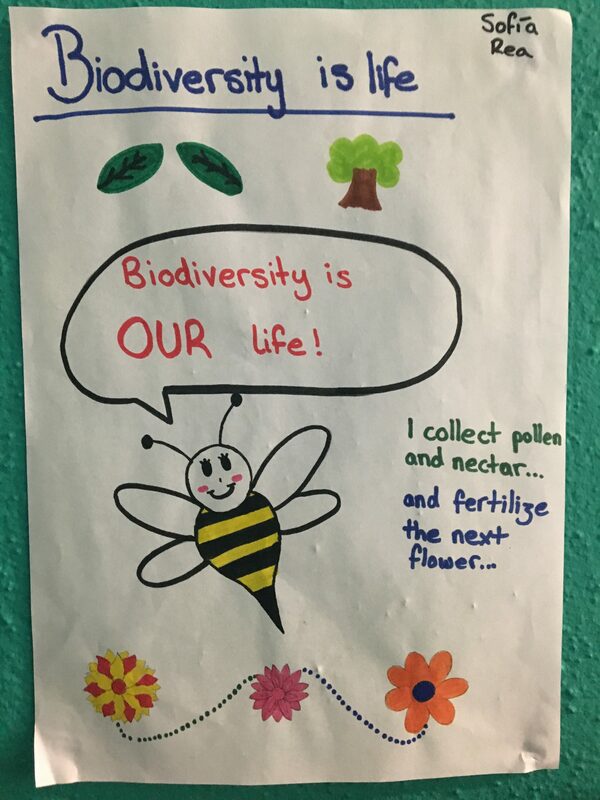 They realized that different pollinators favoured different plants and that a wide variety of plant life will support a larger number of animals and so went about creating an action plan that would include a very high level of floral biodiversity. 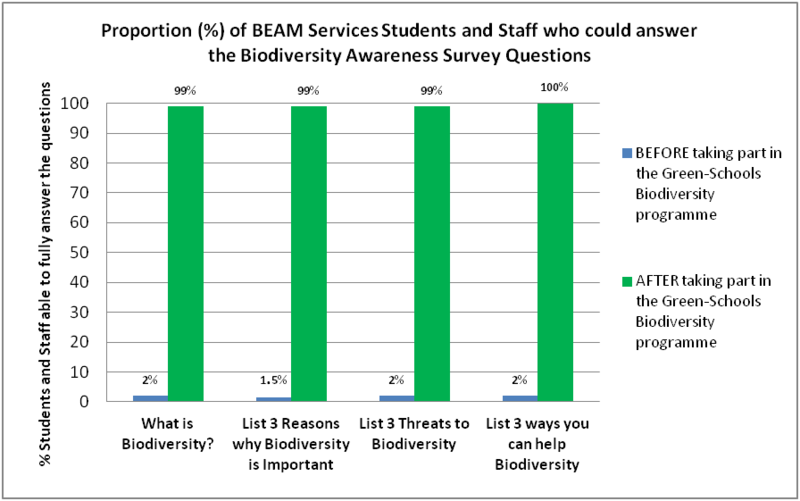 An overall shortage of knowledge on Irish biodiversity among students and staff. A wide variety of plants to support different pollinators (wildflower gardens). The observational skills of the nature around them. Suitable feeding stations to support the local birdlife. Setting up a biodiversity notice-board. Writing letters home to inform parents and caregivers about biodiversity. Undertaking a wildlife study to see what species they had in the area. By focusing on the previous themes and their links with biodiversity. Setting up bird feeding stations. 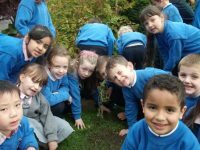 Planting bird friendly fruit bushes. 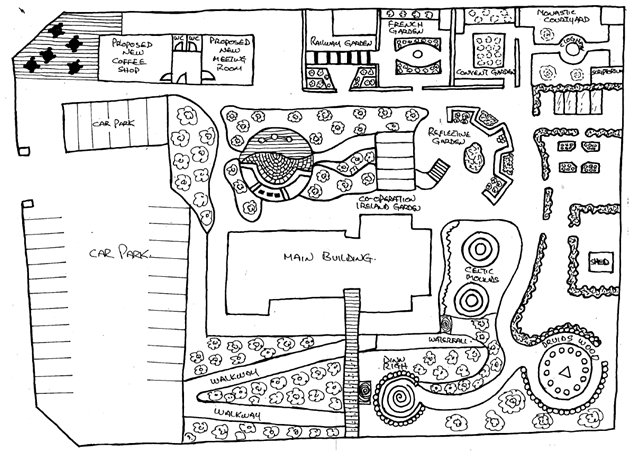 Allowing garden areas to grow wild. Building a bird box with fitted camera. Planting a wide variety of different plants to encourage pollinator activity. They have received a certificate for Organic Standards. Designing a biodiversity brochure and handing them out in the local area. Planting native trees for National Tree Week. Cleaning up the river area (River Barrow). On top of all this they are planning to keep the work up through the summer with a guest speaker coming in to talk about Ireland’s biodiversity and a summer workshop on organic gardening. 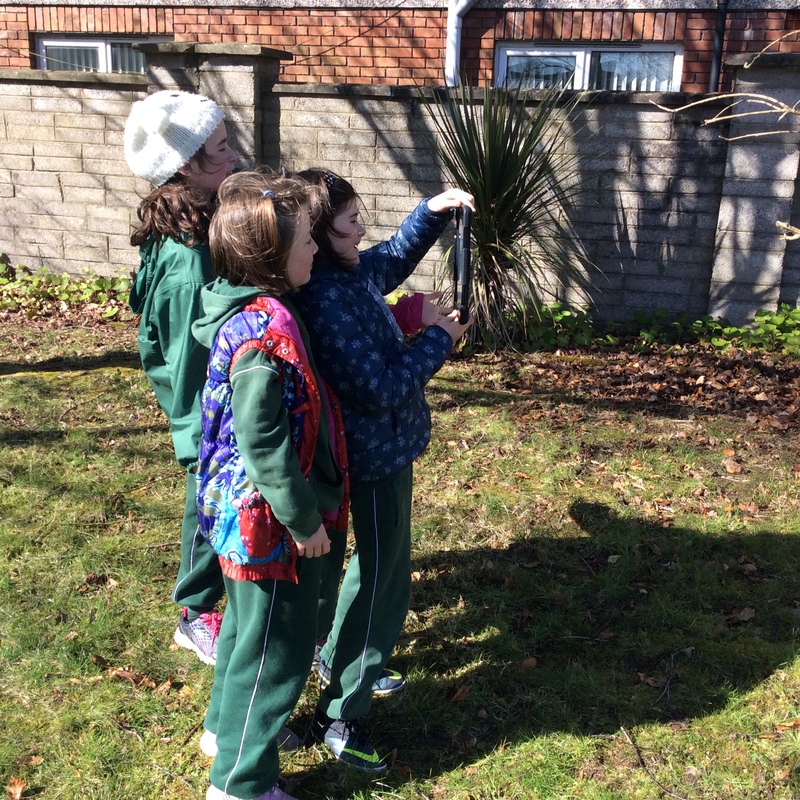 Recording all fauna that is observed on the school grounds. Creating a list of all the plant species in the garden and monitoring to see which species of wildlife benefitted from which plant. 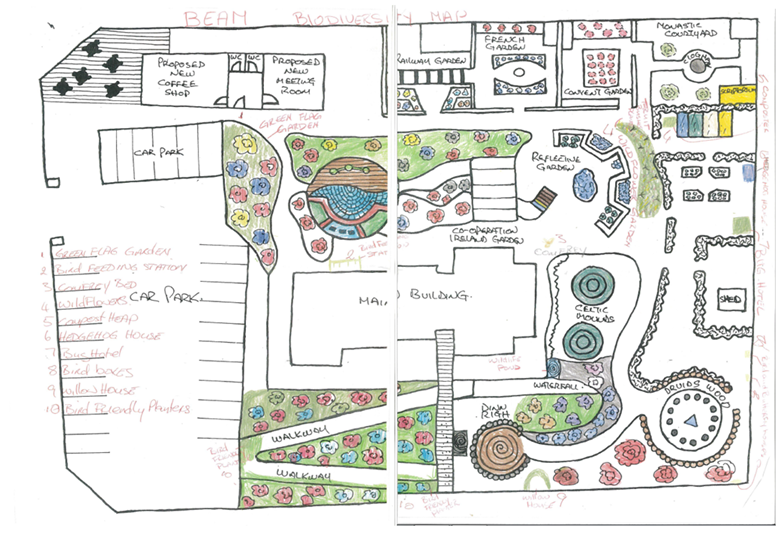 Image 2: BEAM Services Habitat Map 2 (after action was taken) – essential for The Monitoring and Evaluation step. Encouraging families to recycle at home. Recycling old plastic containers to make bird feeders. Undertaking a reuse/recycle drive, advertising to the population of Bagenalstown to drop off unwanted items which were then sold for charity and might otherwise have ended up in landfill. The use of underground geothermal heating. All computers and appliances switched off when not in use. Undertake clean ups on the River Barrow with Carlow County Council. Water harvesting for use in gardens. Conducted a survey to observe the types of travel in the Bagenalstown area. Encourage people to walk or take public transport for longer distances. Art Recycling plastic container for bird feeders and various objects for the garden. Drawing or colouring animals to assist with recognition and species identification. Nature Studies Tree leaf and tree identification. Observational skills while watching wildlife. Worksheet, crosswords and word searches on the theme of nature. Examining field guides to try and identify different species. Gardening Organic Standard Certificate for organic gardening. Writing up/coping articles as writing and spelling practice. During the Action Day, members of the public were invited to join in on a mindfulness workshop and talks about nature based activities for good mental health. 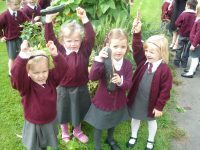 They then held a biodiversity walk to show what wildlife had been attracted into their organic gardens, feeding stations and new habitats they had created. Leaflets were handed out to encourage people to use some of the ideas at home. They developed a wildflower area outside the grounds at Convent Hill in conjunction with the Bagenalstown Improvement Group. They developed another wildlife garden outside the local library which they continue to maintain. 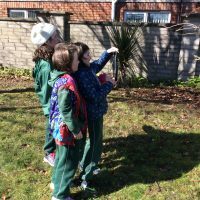 They designed and delivered leaflets to the public informing them of the importance of encouraging biodiversity in the area and giving practical tips on how they could achieve this. As some of the members have a strong love of music, they decided on a very fitting Green Code that was thought to be the perfect representation of biodiversity. This theme, in particular, has fitted in with our Organic Gardening practices here at BEAM. Since achieving our full certificate for Organic Standard in 2013, we have striven to make our gardens a safe haven for wildlife. In fact, a lot of the requirements for the Green-Schools Biodiversity theme would already have been taken on board. The members can see that this year their efforts have really made a huge difference to the wildlife in the area.